In 1898, at the age of 21, Harold Clayton was entering boat design competitions organised by ‘The Yachtsman’ magazine. Even at that early age he was already a competent designer, submitting a design under the pseudonym ‘Ving-et-un’. He was unplaced – the judges considered the beam of 17ft excessive, suggesting that the length be increased to 54ft, though they did acknowledge a very shapely hull form. From the beginning, his Penarth Yacht Building Company had the benefit of considerable business from the Penarth Sailing Club and in the first two years the yard built eighteen vessels, mostly workboats and small dinghies including the popular 16ft Mosquito class, which began in 1900 and which had a class of ten boats by 1902. They were designed by Harold Clayton with a balanced lug rig and a sail of union silk measuring 111sq ft.
As Clayton’s reputation grew, he began building bigger vessels. By 1905 he had three sheds on the beach which included the lifeboat shed now that the lifeboat itself had moved to Barry in 1900; Harold bought the shed for £10.00. The yard built three Bristol Channel Pilot Cutters including Faith which had the appearance more of a yacht. The yard built a number of other boats including a forty-five foot launch for the Neale family, part of the well known Neale & West trawler company that operated out of Cardiff for many years. In total Harold designed and built 123 varied craft up to 53 tons between 1898 and 1913. Harold himself owned eighteen craft starting with the 10ft ‘Dab’ in 1894 to the 30 ton Yawl ‘Zinita’ in 1910. Then in 1913, Harold Clayton’s father, Sir Fitzroy Clayton, died and the yard effectively ceased trading when Harold inherited his father’s Baronetcy – and the responsibilities that go with it. One of Harold Clayton’s former employees (his yard foreman who left in 1903/4 to set up his own boat building business in another shed along the beach) took over the old Lifeboat Shed at around that time. This was Andrew Anderson, a Dane who by then had anglicised his name from Andreas Jacob Knutz Andressen – having been born at Kating on 1st December 1862 in what was then Denmark. Around the age of sixteen (1878), he went to sea as a ship’s carpenter in square rig, eventually arriving at Cardiff or Penarth. Here he met his wife to be Magdalena Dippy (whose family came from the isle of Heligoland – a former Danish territory). Then around 1920 their son ‘Johnny’ (Johann) joined his father at which time the business became Andrew Anderson & Son. In the period up to 1939 they also built boats for the Neale family enabling Anderson to continue through the lean depression years of the 1920s and 30s. Anderson’s boat yard was to remain in business until 1939 when at the age of 77 Andrew fell off a staging and broke a leg at which time the business ceased and ‘young’ Johnny went to work for the government at Chepstow. Intriguingly, several quite large vessels were built in the billiard room of the Neale family house that stood in spacious grounds on the cliff top directly above the boatsheds. Part of the outer wall of the house had to be removed in order to extract the vessels when they were complete and, somehow, having been placed on a sled, they were taken out through the trees onto Paget Place then down the very steep Dock Road to the docks or beach for launching. It must have been a quite remarkable and delicate operation. Two of Andrew Andersons well built cruising yachts made their mark on the world and are still afloat today. The first, the 30 foot gaff cutter, Emanuel was launched in 1928. She was spotted by Commander DouglasGraham while still ‘in frame’ in 1926 when he called at the yard to hire a boat. His home was across the Bristol Channel at Stawell near Bridgwater in Somerset. Cdr. Graham bought her on completion in 1928, naming her Emanuel after a ship of that name that accompanied Frobisher’s Baffin Island expedition in 1578. After several years cruising the western seaboard of Europe between northern Spain and The Faroes. he set off on a single handed voyage to St Johns in Newfoundland in May 1934. From there he cruised north to Labrador, exploring remote inlets and rivers before heading back to St Johns where he was delayed sailing south by a form of blood poisoning. After her return, Emanuel was later sunk after being damaged by ice, of all places, in Poole Harbour. She was raised and repaired but Commander Graham decided to sell her on. In due course she fell into neglect and was found in 1980 in a very sorry state in the Medina River above Cowes. She was bought by Robert and Jan Holden who carried out an eight year major rebuild. Emanuel is now fully restored to her former glory and sails and cruises regularly out of her home port of Ramsgate. Emboldened by the success of his voyage, Commander Graham planned an even greater adventure. He went back to Andrew Anderson in Penarth and ordered a yacht capable of carrying him around the world. The result was Caplin, a thirty two-foot gaff yawl in which Graham set sail in April 1938. This time, when the boat slipped her moorings in Bridgwater, Graham had a crew on board, his youngest daughter Marguerite, who couldn’t cook and had never put to sea in a sailing vessel before! After a tricky start, Caplin crossed to Penarth for some final tweaking and then began her long voyage of adventure. By way of Ireland, Spain, the Caribbean, the Panama Canal and across the Pacific, she arrived at Tahiti to learn the war had broken out. The Graham’s dream of circumnavigating the world was coming to an end. They sailed on to New Zealand where Caplin was sold in Wellington and Graham returned to Britain to rejoin the Royal Navy. Marguerite stayed on in New Zealand for three years before she too returned to England. Caplin had been sold to George Gillies and she remained in the same family, loved and cherished, for three generations. She spent much of those years at Omaru where she was a familiar sight in the harbour. 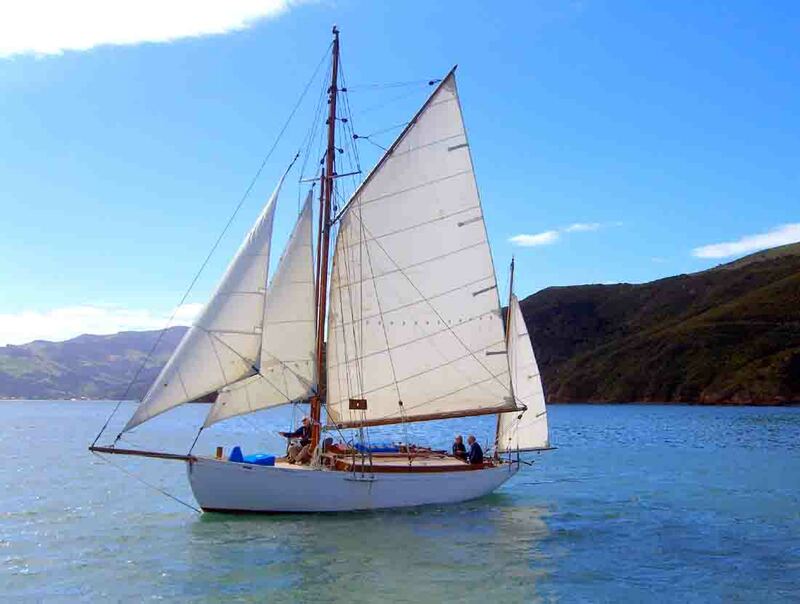 Caplin was sold initially to Hamish Fraser who kept her at Picton in the Marlborough Sounds and who carried out many improvements including re-upholstering the bunks, the fitting of a space heater and a new Yanmar engine as well as a substantial rebuild of her transom. Then in 2006, she was purchased by Dutchman Jan Van De Berg and is currently (2008) kept at Akaroa Harbour on the Banks Peninsular near Christchurch on the South Island. Jan van den Berg is concertmaster of the Christchurch Symphony Orchestra. Caplin has been at sea and has looked after her crews since she was built more than seventy years ago. When he ordered her, Douglas Graham asked Anderson for a strong boat that would carry him safely across the oceans of the world. The boatshed on the beach certainly did that. 1 Although the boatshed buildings remained into the 1950s, there is nothing left now on the beach to show that they existed at all. They are highly recommended reading.